Modern antibiotics are lifesavers. Without them, a simple cold can quickly turn into a deadly pneumonia, an infection in a small cut can mean the loss of a limb, and many ordinary childhood problems turn deadly. 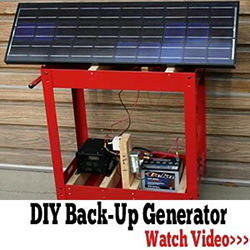 In fact, they have worked so well that we often turn to them as our first line of defense whenever an illness pops up. But what if they were no longer available. In a crisis situation, the supply might be quickly used up, just when they are needed the most. I’ve chosen to stockpile a few different antibiotics for just this reason and I want to show you how you can do the same. There are several ways to build up an antibiotic stockpile. The most expensive way to gather a stockpile is to ask your doctor for prescriptions of the antibiotics you will need. Most doctors will be reluctant to write these prescriptions, so this may not be as easy as it sounds. But if you know your doctor well and he or she is sympathetic, this will work. You could also order your antibiotics from another country where a prescription is not needed. 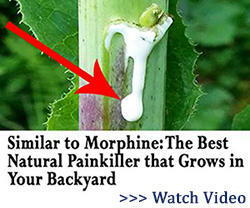 This method also has some risks since you don’t know the quality or authenticity of the medicines you receive. It is also illegal. The method I chose is to purchase pet medicines that are the equivalent of human prescriptions and are available online for a reasonable price. I thoroughly research the maker and the quality of their products before purchase and make sure I know what dosages are appropriate for human use. Let me stress here that it is always preferable to consult a doctor before using any medicine, especially antibiotics. I am stockpiling these antibiotics for use when modern medical care is not available. Amoxicillin is the pink bubblegum flavored liquid that used to be prescribed for every childhood infection. Doctors are wary of prescribing it too often now because of resistant bacteria. It is a penicillin antibiotic that treats many different types of bacterial diseases including: bronchitis, pneumonia, tonsillitis, ear infections, sinus infections, urinary tract infections, E. Coli, salmonella infections and some STDs including gonorrhea and chlamydia. Standard dosage is 250 mg every 8 hours or 500 mg every 12 hours, depending on the illness and severity. 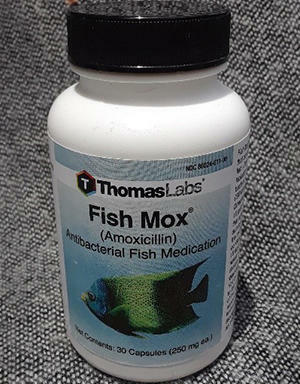 I purchased Fish Mox, the amoxicillin equivalent made by Thomas Labs. 30 tablets, each 250 mg, cost me $9.99. These tablets are marked as not for human consumption, but their formulation is identical to the amoxicillin that is made for human use. Ideally, I will stockpile several bottles of Fish Mox, since each 30 tablet bottle is enough for 1 treatment. Ciprofloxacin is an antibiotic in the fluoroquinolone class. It works by stopping the multiplication of bacteria, preventing the spread of the disease and promoting healing as the existing bacteria die off. I choose to stockpile Ciprofloxacin because I have seen it work miracles when other antibiotics have failed and it covers a wide range of infections, including some that might be expected in a SHTF situation. Ciprofloxacin treats infections in the skin, lungs, bones, joints, and urinary tract. It treats infectious diarrheas caused by E. Coli, Campulocater jejuni, Shingella, septicemic plague caused by Y. pestis, tuberculosis, anthrax, and typhoid fever. 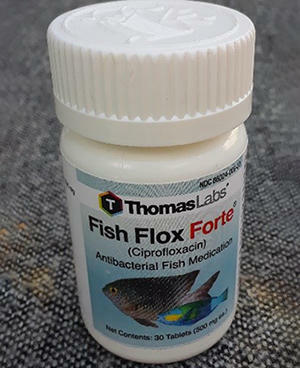 For my stockpile, I chose Ciprofloxacin Fish Flox Forte made by Thomas Labs A bottle of 30 x 500 mg tablets cost me 38.99 on sale. For most infections the usual dosage is 250 to 750 mg every 12 hours. Metronidazone is the generic name for Flagyl, an antibiotic that is effective against anaerobic bacteria. It is used to treat diseases of the abdomen such as peritonitis, liver abscesses, and abscesses of the ovaries and Fallopian tubes. 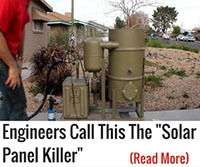 It is also effective against Giardia lamblia and amoeba, two intestinal parasites that are common in contaminated water, as well as trichomonas which causes vaginal infections. 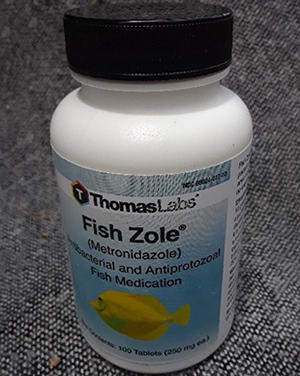 I purchased 100 tablets of Fish Zole made by Thomas Labs which contains 250 mg of metronidazole per tablet for $58.25. The recommended dosage ranges from 250 to 750 mg, three to four times daily, depending on the illness being treated. 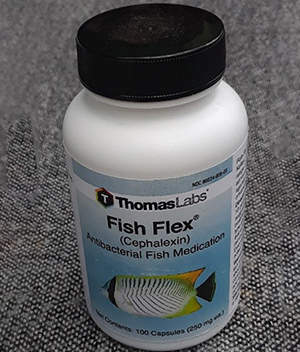 Fish Flex is the Thomas Labs equivalent for Cephalexin. I purchased 100 tablets of 250 mg each. Cephalexin is a cephalosporin type antibiotic that treats gram-positive bacteria. It has many of the same uses as the penicillin class antibiotics, but it can be taken by most people that are allergic to penicillin. It is very effective at treating skin and soft tissue infections such as boils, carbuncles, and deep tissue infections. It is regularly prescribed to treat bladder infections, upper respiratory infections, bone infections, kidney infections, ear infections, pharyngitis, prostatitis and to prevent bacterial endocarditis during some dental procedures. I also stockpile an external ointment known as drawing salve or black drawing salve. 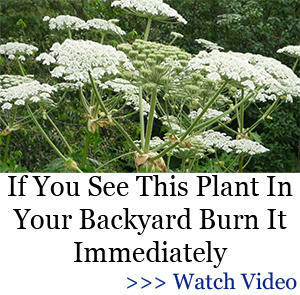 I began using it long ago on skin infections and have seen it work wonders. It prevents infections when used promptly, even in deep cuts and I have seen it cure infections that had become established and were not responding to antibiotics. Ichthammol is ammonium bituminosulfonate, a sulfur compound that has anti-inflammatory, bactericidal and fungicidal properties. It treats and promotes healing in skin infections and skin diseases such as psoriasis, rosacea, and acne. 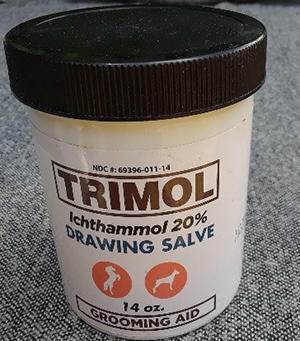 A small 1-ounce tube of 20% Ichthammol for human use is currently $10.98, but I purchase the large 14 ounce tub for use with horses and pets for $14.99, a big savings. 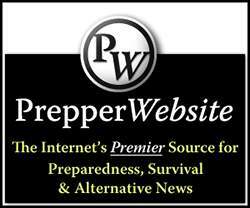 Many preppers choose to include erythromycin in their stockpile. I considered it and decided against it for several reasons. Amoxicillin and Cephalexin treat most of the same diseases that erythromycin is used for and erythromycin has a short shelf life. It degrades into a potentially poisonous substance that can be dangerous. Most antibiotics have long shelf-lifes that extend far beyond the expiration date. It is available in a powder form for fish use, but I was not happy with the information available on the formulation. Many preppers do use it, so do your own research if you decide this is an important antibiotic for your family stockpile. You want to be very careful when purchasing pet medicines. I researched the makers of antibiotic products thoroughly and chose to go with products from Thomas Labs because their products are USP certified quality antibiotics which helps me feel confident about the safety of the product. Their products also come in convenient tablet or capsule doses so there is no guesswork on doses and no need to make my own capsules. One bottle each of the 4 antibiotics I chose cost me a total of $140, including sales taxes, a reasonable expense for the protection they provide. I recommend a minimum of 1 bottle of each, per person in your household, and extras are always a good idea. This is not a long-term solution. You should also have a variety of natural remedies at home. I have a backyard garden that has all the medicinal plants I need. These pills are just in case I need a stronger dose. I haven’t had to use this stockpile yet as I managed to treat my ailments with plant-based tinctures and infusions. Note that Cipro has some long term side effects, including degeneration of tendons. I trust vet meds. It’s one thing to put granny in a bad way with bad meds and it’s entirely different to harm a $2 million race horse. No disrespect intended. I am sorry for your loss. I was merely trying to point out that the same care is given to manufacture of vet meds as human meds…. often by the same company and same production line. You should seriously consider adding tetracycline to your list, because there are a number of serious rickettsial diseases such as Rocky Mount spotted fever and some other similar such illnesses for which your list of antibiotics would prove inadequate. I have no idea if there is the “pet form” of this, but it is still worth trying to find this antibiotic. Hi Iguana, Tetracycline is certainly very useful; however, it is one of the medications that must be used by its stated expiration date since it degrades and becomes toxic to the liver when it is stored for a longer period of time. So, you would have to be very careful not to use any expired Tetracycline. If I vacuum sealed tetracycline in a bag with an oxygen absorber, wouldn’t that make it store longer? Isn’t the oxygen and humidity a big part of how long it keeps or why it degrades?? A drug salesman from a large drug manufacturing Co. told me the difference in human and animal antibiotics was the label on the container. I would like to know where to buy those items. Check Pet Smart or go to an online vet supply…there are several. I checked one source and they wanted a prescription from a vet. I use Thomas Labs online. After some of my own research conducted independently, I have come to a very similar list as the one presented in this article. The only thing missing is azithromax (Z-pak). Unfortunately, it is difficult to obtain this legally without a prescription. 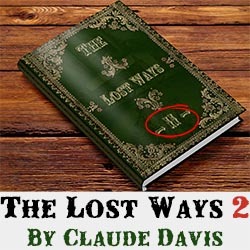 thank you for all the great info over the years, especially the medicinal plants,trees and herbs to use .i trust your knowledge and the lost ways 1and 2 are excellent resources of what we have lost through the years. There are many research papers about how dangerous it is to use fish-antibiotics due to the incorrect dosing, and sheer guessing-games you’d be playing with your lives when you use the wrong antibiotic for the illness. I’d be all for stocking up on life-saving antibiotics – IF – I also had at least one or two medical professionals in my bunker. Otherwise, you could be creating bigger problems for you and your family. I’d stick to all-natural, eastern medicine and holistic choices if I didn’t have an experienced doctor and nurse in my SHTF survival group. Treat the symptoms, and let the body do its thing to fight back naturally. Elderberry, Nutmeg, Tumeric, Ginger… these are all very helpful natural ways to boost your body’s ability to fight infections and viruses. Thomas Labs is the same U.S. lab company that makes the antibiotic pills for humans. They are the same pills. The numerical code imprinted on a particular antibiotic designated for fish, will be the very same numerical code imprinted on the human version, that can be looked up in any prescription drug book for nurses – as it is the very same pill. I wouldn’t trust anything made outside of the U.S. or anything that is in powder form designated for fish. I only use the pill form, from Thomas Labs. The ‘Not for human consumption’ is for liability and no need for prescription legalities, only. Cipro is a second generation Fluoroquinolone made by Bayer. Ciprofloxacin is the generic. I am sympathetic to a point. 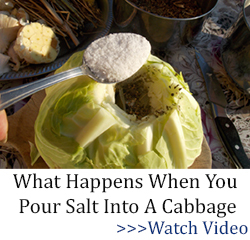 But bear in mind, in a SHTF situation, you may not have the luxury of letting you body rid itself of the bacteria that killed millions over the course of history. Get hold of a current Nursing Drug Handbook. Self help is one of the critical areas that should be studied before an event. Not preaching, just suggesting that knowledge is power. I know far more about the damage caused by fluoroquinolones then I ever wanted to not just by my wife but by hundreds of thousands of other people that have been damaged by the things like Cipro. Don’t just take my word for it do a search for yourself you do not want to take these in any situation. So beyond the expiration date, in your estimation what is the shelf-life of these antibiotics? Again, check the military/FDA SLEP …Service Life Extension Program. The gov spends untold millions thtpwing out perfectly good mefs…hence the SLEP study. Thanks! never heard about this. We stock colloidal silver, Turmeric, Garlic, and tea tree oil. Oil of Oregano in capsules leak in storage so we have a few. Silver Wings makes silver, Aloe Vera gel with Tea Tree oil I use for external injuries. It has 200 PPM colloidal silver infused in it. No No No!!!! Don’t not EVER take anything in the Flouquinolone class such as Cipro! Levaquine, in the same class, was a significant contributor to my wife’s suicide. As recently as July 10th the FDA issued yet more warnings. Many are life altering and permanent. See kpaddock DOT com/fq for links to the warnings. Also I’m up to 39 people that said their Cerebrospinal Fluid leak started after taking Ciprofloxacin or Levaquine etc. These drugs will be removed from market someday. The manufactur of Levaquine has already stopped manufacturing iy. Sadly the generic is still being made. I’m sorry for your loss. I understand. I took flagyl once and had a drink…the next day I had no mind! I was wanting to drive off of the bridge….no reason. I had no idea. Luckily I had a friend who talked to me and made me realize I needed to go to his house where he watched me til I got past it. Who would know that? NOW they put warnings on the bottle but it says to avoid alcohol. That’s all. Not that you could lose your mind!! Again I’m sorry you had this happen to you and some meds really do this. There is no way to know unless it happens to you or someone who tells you. Luckily for me I’m allergic to cipro so I wouldn’t do it but I could have…. Thank you for sharing. suicidal ideation is also one of the side effects of Neurontin / Gabapentin often improperly is prescribed for treating chronic pain. I could not care less of one in a million odds of developing suicidal thoughts if Cipro saves me from a 100% chance of death from infection. Not sure where you got those off. Reality does not support them. Nor does the FDA. On July 10th the FDA published yet more warnings. These on hypoglycemia and the possibility of permanent psychosis caused by fluoroquinolones. Hey Hoss …. you sound like an x-spurt … you know, x, an unknown quantity and spurt, a drip under pressure. Kind of obvious that you have your nose out of joint for some reason. May I suggest you do a bit more research on fluoroquinolones before you run your keyboard? Essential oils are no substitute for antibiotics. You should read some medical history to get a picture of just how bad things were in pre-antibiotic times. A cut, an animal bite, an infected boil – all of those could kill you. Once an infection took hold there was nothing you could do except hope your body killed it before it killed you. With antibiotics, assuming the clowns who take them for three days every time they get a cold don’t mess it up for us by creating more resistant strains, you can knock most bacterial infections right down. Essential oils just don’t do that. They might have their uses, but they are not a replacement for antibiotics. Nothing is. I’ve always wondered in doxycycline becomes toxic like tetracycline after expiration. They are closely related. I won’t use any antibiotics beyond one year after expiration because you don’t know how much of their potentacy they’ve lost and you could be contributing to antibiotic resistance. I took doxycycline that was past expiration. Far past expiration. Spent the next 2 days puking my guts out. what r y’all gonna do when u run out? or if y’all get a superbug that that junk won’t cure? there’re 2 books y’all might consider adding 2 your resources by stephen harrod buhner- natural antibiotics n natural antivirals- grow your own n learn 2 make your own medicine! From what I have seen online, you have to have a prescription from a vet before you can buy any of these. Is that correct? I took a month worth of Cipro when I got Car Scratch Fever as a teenager. Yes it’s really exists…anyhoo, the whole time I was taking it, I had the most violent dreams, graphic violence. I still remember them 33 years later. I was not suicidal, however, I was NOT myself. Had no idea it could have been the antibiotics. Antibiotics expire, become less effective or noneffectivecand even toxic with age. I guess we could purchase these vetmeds periodically to make sure we have a good batch when SHTF. So do these pet meds have the same side effects on the pets? Or are these side effects a result because they are engineered for our pets? Just curious, I am very ignorant when it comes to these things. Animal (particularly predator species) internal organs often process substances differently from those of humans. Chocolate and aspirin poison canines. Shouldn’t be giving them to felines either. On a third hand, polyethylene glycol (antifreeze) poisons all mammals and birds. I’ve given my dogs plenty of human meds. My husband and I have taken plenty of canine meds. Mostly antibiotics and Tramodol, which doesn’t work as well as an Advil. My GP got alarmed, but he’s ok.